Last months have been quite busy. Since the last major release of our Pronamic Pay plugin we released several smaller updates. From fixing small issues to updating libraries and adding icons, for example for the ‘Handelsbanken’ bank. 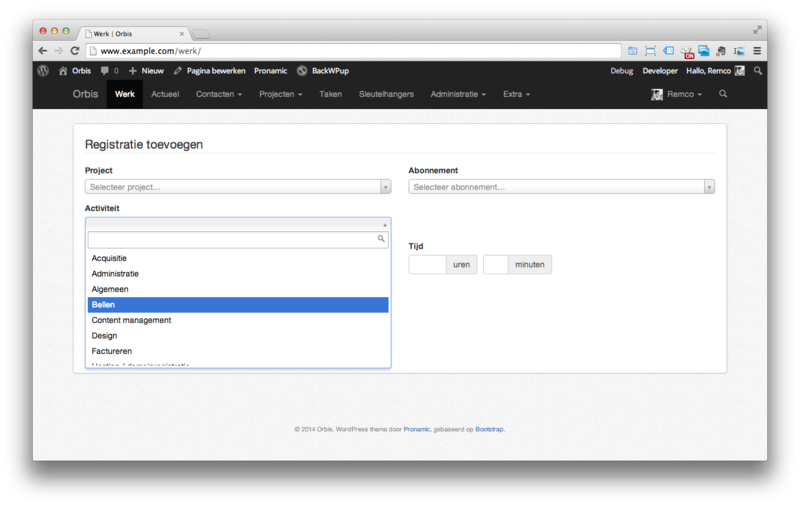 With the latest version 5.6, we’re adding integration of Adyen for WordPress! Find out what’s new in Pronamic Pay 5.6 and the new Pronamic Pay Adyen Add-On. The Pronamic Pay plugin is a one-of-a-kind plugin. It is the only plugin with support for as many payment providers and WordPress plugins as possible. With the latest update to version 5.4 we add support for Ninja Forms. You can download Ninja Forms for free from the WordPress Plugin directory. It already has more than 1 million active downloads, which makes it one of the most popular form plugins for WordPress. Next to Gravity Forms and Formidable Forms, Ninja Forms is the third forms plugin supported by Pronamic Pay. With the latest update (version 3.6) of our Pronamic iDEAL plugin we have made huge improvements for supporting Easy Digital Downloads. 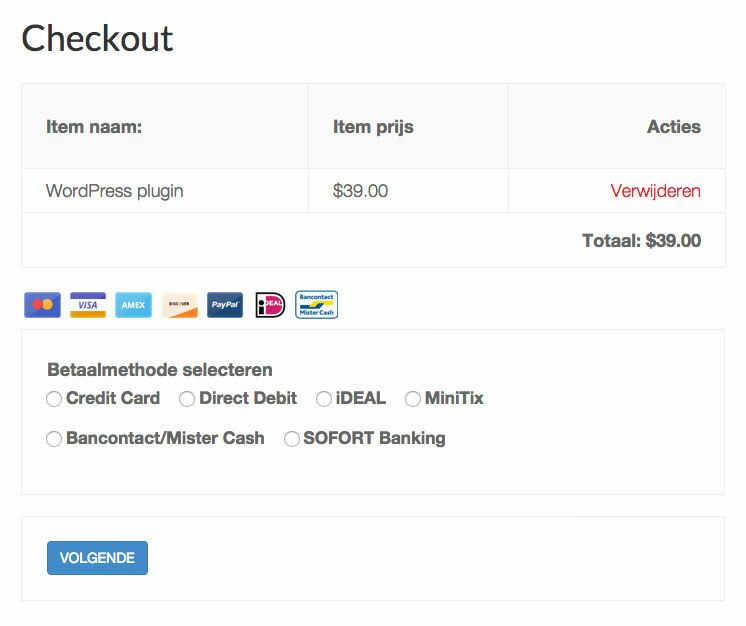 It is now possible to add multiple payment gateways to the checkout page and you can give your own description in the checkout label. In version 1.3.0 of the Orbis Timesheets plugin we added the feature to manage activities. This allows you to add different activities so users can classify their timesheet entries. 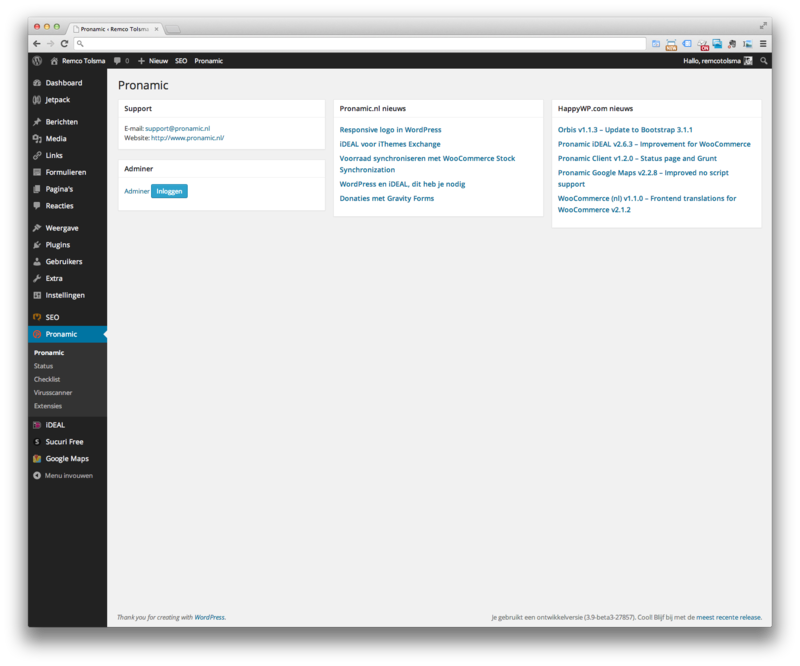 As WordPress developers we sometimes need access to the WordPress database. Most hosting providers have their own phpMyAdmin installation for access to the database. There are also a few WordPress plugins around wich add phpMyAdmin or Adminer to your WordPress installation. We very often used the Adminer plugin from the WordPress.org plugin directory, this is an very easy and clean plugin with Adminer. Now also the Pronamic Client plugin contains Adminer, to make it easier for Pronamic clients to access their WordPress database. We moved the WooCommerce Stock Synchronization Plugin from CodeCanyon to HappyWP. The WooCommerce Stock Synchronization Plugin allows you to synchronize the stock values of the same products across multiple WooCommerce websites. A great solution for multisite WooCommerce sites or seperate WooCommerce sites for distributors and end users. Tweak – Adjusted project time colors. 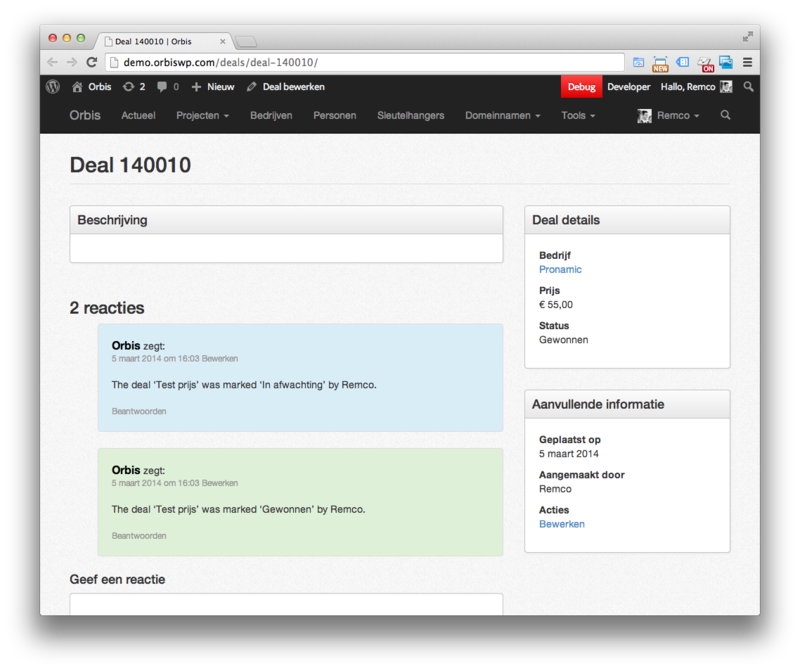 Tweak – Improved support for the Orbis Deals plugin. Tweak – Display all comment types. Tweak – Added support for different comment content background colors. Tweak – Updated Bootstrap from v3.0.3 to v3.1.1. The most important tweak is the support for the Orbis Deals plugin and different comment content background colors. 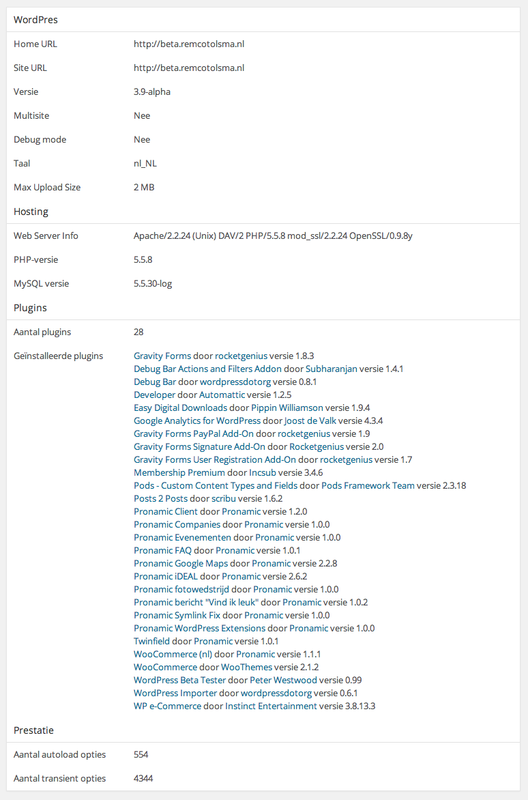 Pronamic just launched version 1.2.0 of the Pronamic Client plugin. 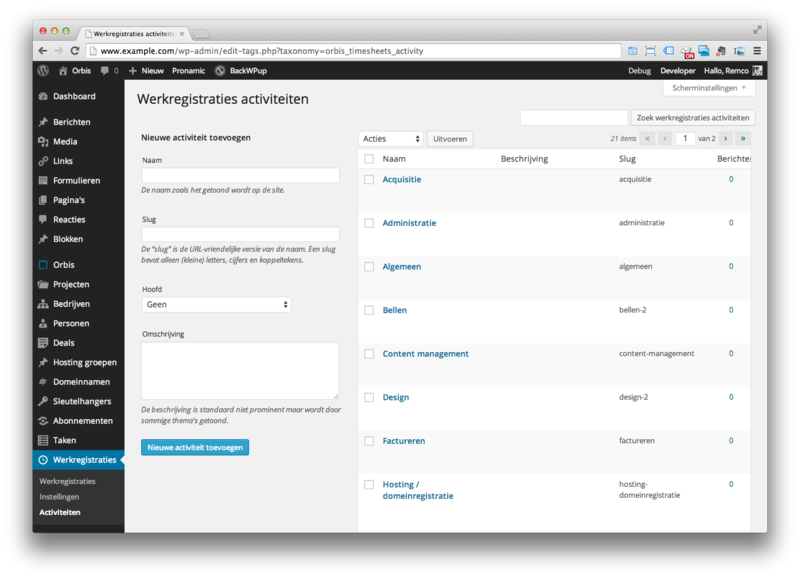 In this version we added an WordPress admin status page. It contains some basic information about versions, plugins, hosting and performance. We now also use Grunt to automate some development tasks like creating the POT files and checking version numbers.